Table top thermal transfer printer pouch printing equipment for foil bags, film bag, Tyvek pouches. Will print directly on pouches, flat products and foil laminate pouches. 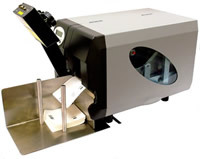 The machine feeds pouches from a magazine, and utilizing a high definition thermal transfer printing enables the equipment to print directly on the pouch. This eliminates the need to use a label to print information on the pouches.